For my birthday last year my wife gave me a set of antique planes (Hollow & Rounds, Nos. 2-18 Even), which I proceeded to clean, polish, sharpen and otherwise restore to working order. I then went on to find and purchase several other antique wooden planes to add to the collection: a Screw-arm Plough plane, Moving Fillister, 1/4″ V-Grooving, Skewed Rabbet and a pair of Snipes Bills. I just found, and am waiting for, a set of graduated irons for the Plough plane, which was a great find! Cleaning them up and sharpening them ought to be a fun project for the coming weekend. With that aspect of the project completed I needed a nice place to store them. I ‘inherited’ an old “Lane” record cabinet from my brother-in-law’s parents (Alice and Bob), which was full of old albums. 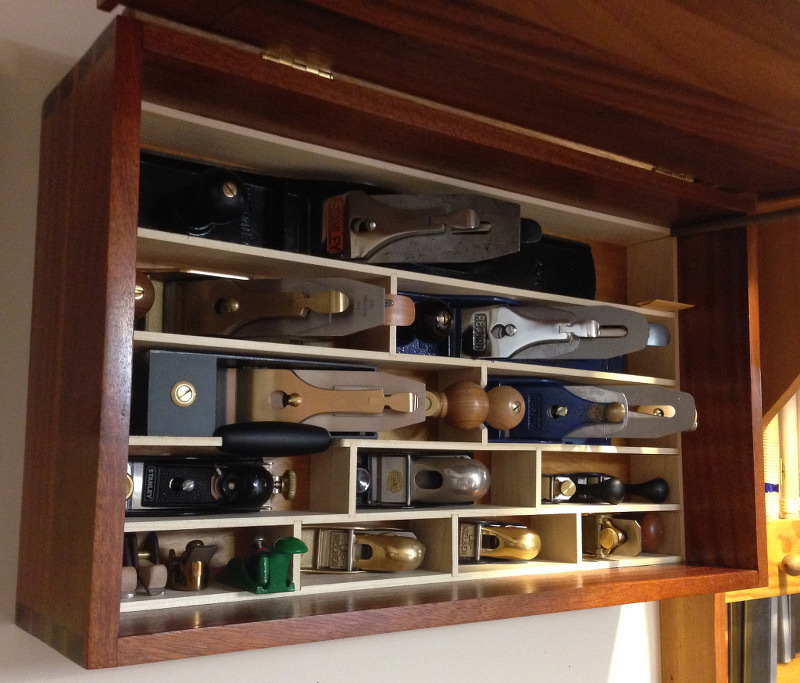 I still have all the records but have repurposed the cabinet into a suitable repository for my planes, some chisels and mallets, as well as other hand tools. The new old tool chest still has quite a bit of room in it for some other pieces as well as future acquisitions! So, it will henceforth be referred to as the A&B Tool Chest. 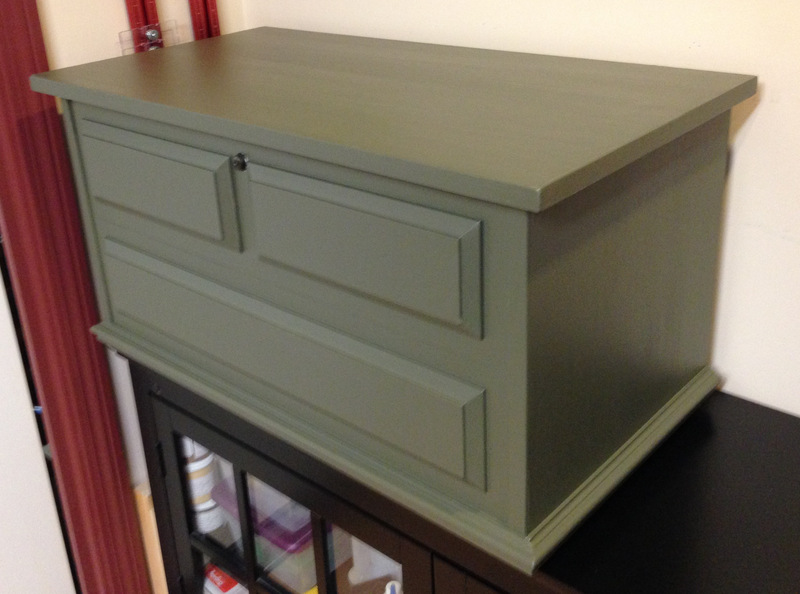 The paint I used is “Old Village Forest Green”, oil-based. Old Village is a small producer in Pennsylvania, making beautiful high-quality paints. A little more expensive, but really worth it. On this chest I put primer, then 2 coats of paint, sanding in between. This is the paint (although a different color) I plan to use on the Harpsichord I’m building. A couple of years ago I built a wall hung plane cabinet made from some beautiful 3/4″ Mahogany given to me years before. My ‘metal’ plane collection has grown a fair amount over the past years. This is conveniently hung just about 4 feet from the workbench and I prop the cover open with a walnut dowel. Wall-hung Mahogany Cabinet, hand-cut dovetailed box. The rest of my hand tools and other paraphernalia is stored on a pair of French Tool Racks that I built from a plan/idea in Popular Woodworking a couple of years ago. 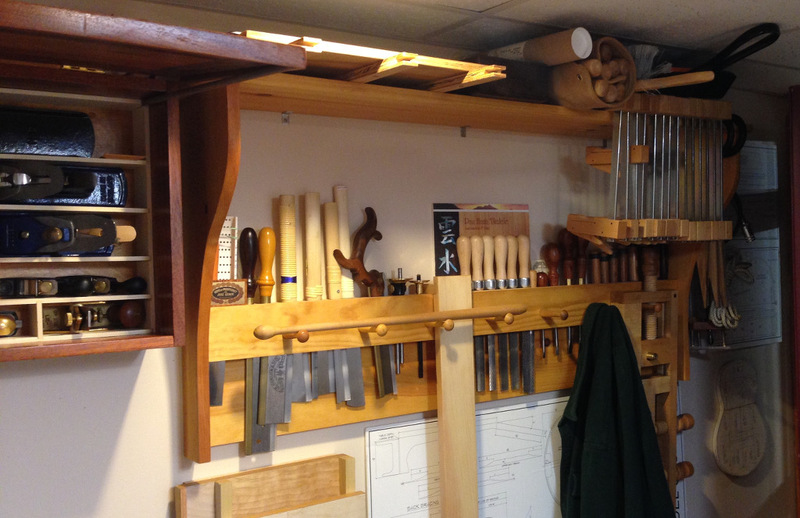 Storage on top, and plenty of room to hang saws, rasps, luthier clamps, etc. 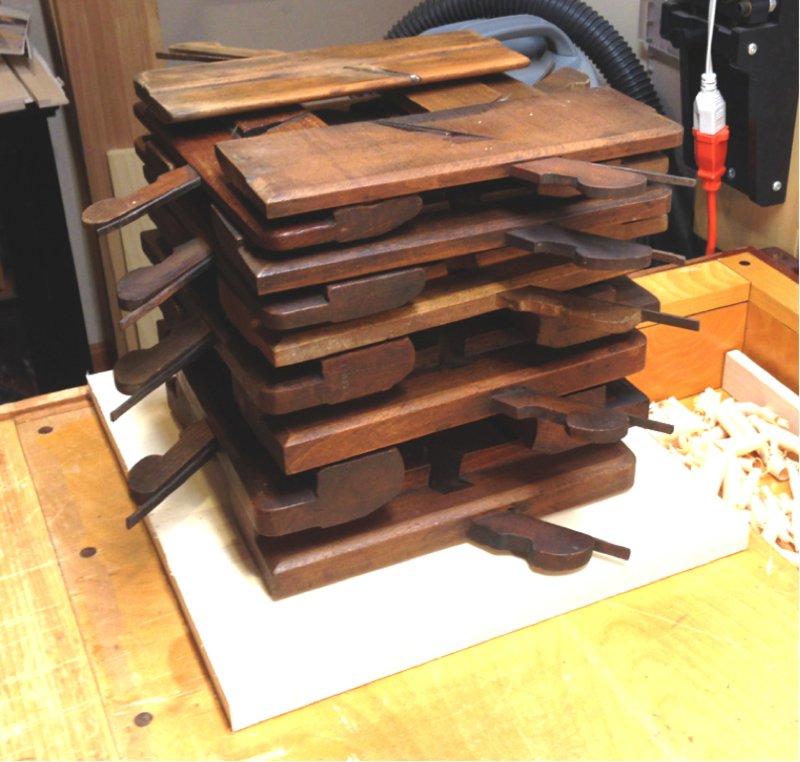 This entry was posted in Lutherie, Tools, Woodworking and tagged lutherie, tools, woodworking. Bookmark the permalink.